Apparently, growing your own produce isn’t that hard. You simply outsource the fertilizing of your basil, mint and cilantro to your pet fish. That’s how it works on Aquafarm — the hydroponic garden that’s the latest invention from sustainable living startup Back to the Roots. It’s a closed, self-sustaining system where the fish waste feeds the plants, and the plants clean the fish tank water. The tank is small. Just 3 gallons, it’s comfortable for one fish — whose waste alone is enough to create the perfect fertilizer for your lettuce or wheatgrass to grow. So there’s no soil. The plants are in a bed of rocks, and the fish takes care of the rest. The idea isn’t totally new, but the scale of it is. 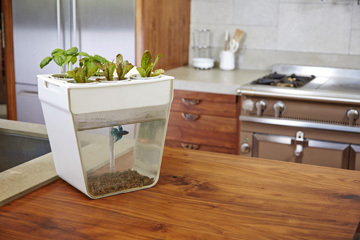 Specifically the teeny tiny scale that allows Aquafarm to sit on your kitchen countertop. Co-founders Nikhil Arora and Alejandro Velez studied aquaponics farms, which are normally the size of a pond or bigger. These are — you guessed it — farms where the fish waste creates natural, organic food for the plants that farmers are growing, and the plants clean the pond for the fish. “We took [the idea of] these big aquaponics farms and made the smallest system ever created — with help from aquaponics experts and industrial designers,” Velez said in a video interview. The bottom line: Their invention helps you turn natural waste into actual food. But this isn’t the first time Back to the Roots has done that. It’s actually the second. Their first product is a mushroom kit that allows you to grow your own edible mushrooms at home — with leftoever coffee grinds. Breakfast’s trash is next month’s salad.